In today’s saturated market of information overload, you can become inundated with advice on how best to win and retain new business. While you’ll come across valid information, we believe client retention boils down to one simple thing: trust. It’s not enough to close a business deal; you’ve got to work hard on nurturing that relationship to ensure that customer sticks around for the long-term. Taking it one step further, focusing all your sales and marketing efforts on new business alone may cause you to miss a huge area of growth: the kind that comes from your existing customer base. There are various things you can do to earn and keep your client’s trust, but one really powerful approach is to consistently send your clients custom reports. Why do clients care about custom reports? The simple answer is that reports show your clients everything you’ve been working on - the good and the bad. Reports keep things highly transparent between one another and help position you as a trusted partner rather than just another vendor. Also, your client hired you for a specific reason but is likely too busy to stay on top of everything you’re doing. Reports help them see your value and remind them what they’re paying you to do. Reports should serve as a way to give your client an easy, digestible view of all the most important data pertaining to your relationship. When clients don’t have to chase you down for answers they want, and instead have reports delivered to their inboxes on a consistent basis, it sets the tone that you’re reliable, invested, and committed to keeping the partnership healthy. So, what do clients care about seeing in their reports? What you include in your client reports will vary from customer to customer, but there are things you can keep in mind to help guide you while setting up each report. - What did my client hire me to do? If you were hired for your remote management capabilities, then you’re definitely going to want to report on your client’s workstations and machines. Are patch statuses up to date? What was deployed or configured this week? Are there upcoming warranty expirations clients should be aware of? As another example, let’s say you’re an Autotask user. 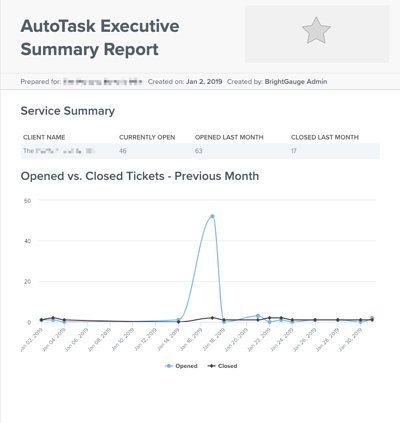 Your custom Autotask reports might include metrics specific to your client, like the number of their tickets your tech responded to, the number of hours billed towards that client’s projects, and so on. This helps give clients a visual sense of what their investment in you translates to. Use your service level agreement (SLA) as a basis for what to prioritize in your reports. - How much time can my client spend on reviewing my reports? Imagine your client only has 5 minutes to look at each report you send over. You want to maximize that time. Include metrics that are going to have the biggest impact in the short amount of time you have your client’s attention. 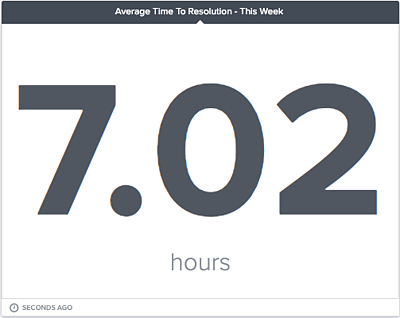 Going back to our Autotask report example, you might consider including metrics like Average Time to Resolution This Week, Hours Worked by Client This Week, SLA Results Overview, and Tickets Per Endpoint. Choose metrics that really show why you’re an integral part of your client’s team. Also provide data that can help your client make better business decisions that lead to growth and scalability. - How often am I sending this report to my client? The frequency with which you choose to send reports to your clients also has an impact on the data you’re going to include. If sending a daily report, you’re likely going to hit your client with quick facts about the previous day (such as those Autotask ticket statistics that may pertain to them). Weekly reports are also likely to summarize activity in a condensed manner. However, if you’re only sending reports on a monthly or quarterly basis, you’re probably going to get more granular with your data and cover a broader range of topics. Maybe you’ve been hesitant about making client reports a top priority because they can be complicated and time-consuming to produce. Transferring data from your multiple solutions onto an Excel sheet and then using formulas and pivot tables to turn it into something that makes sense for your client is a lot of work. We’ve heard of report-production taking 8-10 hours (of non-revenue-generating-time) per week. But the reality is that reports don’t have to be a struggle. A tool like BrightGauge automates reports, so you can have them set up and sent out in a matter of minutes. And the payoff is huge (think: clients that stick around for the long-run, a better reputation, and more revenue). 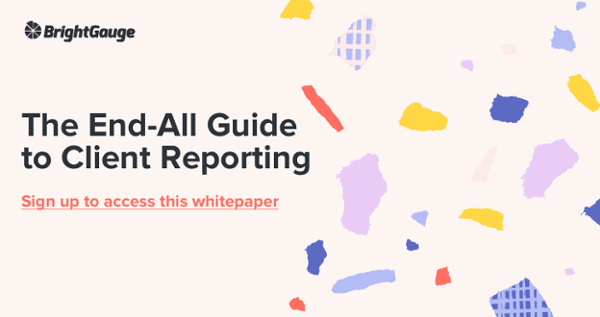 We’ve just scratched the surface of client reporting here, but our End-All Guide to Client Reporting goes into detail about the who, what, why, when, and how of reports and covers more metrics to include. Download it now.